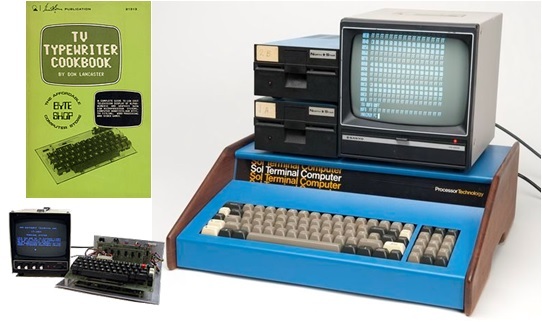 My journey in personal computing begins forty years ago. And it started by accident. Forty years ago, I was operations manager at CJOB. Working with the engineers, mainly. Every radio station receives a continuous stream of news, weather and sports information. During the old days, this information printed on a teletype machine. Newsroom staff would rip off each item from a long spool of paper. Someone came up with the idea of that it would be good to display the information on a TV screen in the on-air studio. That way the announcer could see directly what has going on between scheduled news and sports casts. I decided to figure out how this could be done. Around the same time, hobby computing was starting up, mainly in California. As I researched ideas to put the news wire on a TV screen, hobby computing provided inspiration. I had two problems to solve. The first was how to display data on a television screen. The second was how to convert news wire data from its 5 bit code into 8 bit ASCII. Don Lancaster wrote his popular TV Typewriter Cookbook in 1975. It explained how to convert data into video and create a very early personal computing terminal. Professional terminals and monitors were expensive, so why not use a TV instead? Unlike modern terminals, Don’s design provided 16 rows of 32 characters – and no color! His designs were documented in many Radio Electronics magazine articles starting in 1973. A company called Southwest Technical Products Corporation in Texas came out with some TV typewriter kits. The same year, Lee Felsenstein came up with the Processor Technology SOL-20 PC. It used the S-100 bus and had 4K of RAM. Using cassette storage, and later NorthStar Disk Operating System, we could write programs in Basic and run them fine. So, between using Don Lancaster’s designs and writing some supporting code in Basic on the SOL-20, were were able to project news, weather and sports information on a TV set in the main studio. Announcers loved the up to date information. Newsmen loved not having to deliver scraps of paper to the studio. As a result, everyone was happy. I loved it because once the personal computing hobby door opened, good stuff just kept on coming. Just like the hit songs on the radio station.